The Sony LMD2451MD/DVI (LMD-2451MD/DVI) 24″ Surgical Monitor is a 24” full HD widescreen LCD monitor that has been added to Sony””s comprehensive medical-grade display line-up. Built upon the same platform as the popular LMD-2450MD, it offers a superb quality WUXGA (1920 X 1200) LCD panel, 10-bit signal processing, Sony ChromaTRU™ color balance technology and new integration friendly features including enhanced DVI interface and multi-modality support capabilities. 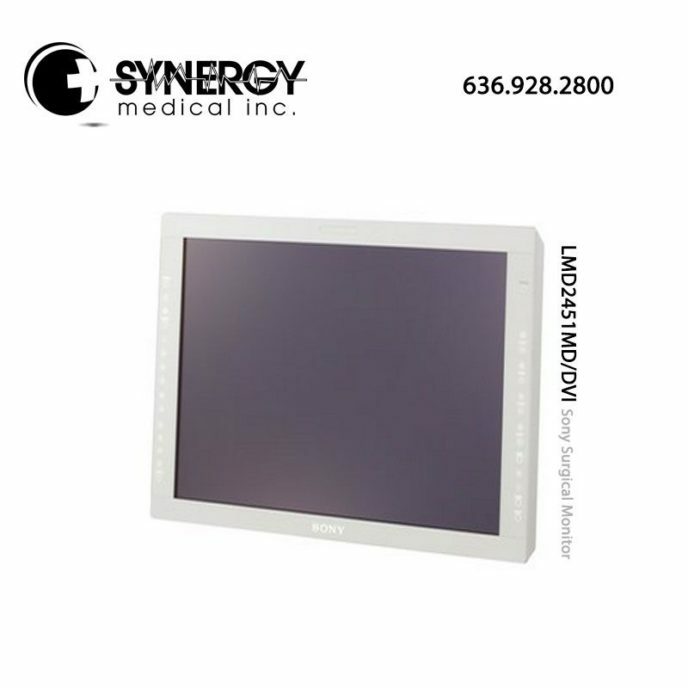 The Sony LMD2451MD/DVI (LMD-2451MD/DVI) 24″ Surgical Monitor comes configured with the built-in BKM243HS HD-SDI board. It features two unique built-in option slots designed to accept a variety of additional option boards (including two new option boards) to easily expand, select, and change input/output signals for integration into virtually any system environment. Installation of the new BKM-256DD option board expands the monitor’s capability to accept up to two DVI inputs and one DVI loop-through output. For optical fiber transmission, the 5V power required to power a DVI-D to fiber optic converter is supplied from both DVI-D input and output connectors of the BKM-256DD option board. This enables easy integration of optional DVI-D to fiber optic extension converters. Installation of the new BKM-250TG option board enables the LMD-2451MD/HD to accept a 3G input 1080/60p signal via a single SDI cable. Incorporating industry-leading Sony HD technology and versatile input/output signal capability, the LMD-2451MD/HD is the perfect addition to today’s HD operating rooms.